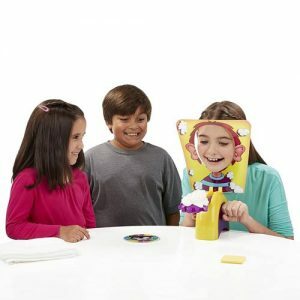 The cake smash pie face game is a board game that throws pie in your face depending on your luck of the draw. The simple Cake Smash Pie Face game brings friends and family together for lots of laugh-out-loud fun. First, players load the arm with whipped cream (not included) or the included sponge. Then, they take turns sliding their heads through the mask and spinning the spinner. Players turn the handle the number of times indicated on the spinner and the tension on the arm builds. Then, suddenly someone gets whipped in the face! Is there anything funnier than someone getting a face full of whipped cream? Now families can bring the silly fun into their homes with this laugh-out-loud Pie Face game. Just load the arm with whipped cream (not included), spin the spinner, and hope that someone else gets whipped cream on their face! Game includes a sponge that can be used in place of whipped cream.For birthdays, use cake or cream.